A discussion with synthetic biology pioneers Drew Endy, George Church, and David Baker. Synthetic biology has advanced in leaps and bounds in recent years, with innovations ranging from re-engineered genomes to improved crop strains and DNA as a data storage device. The latest game-changer comes in the form of next-generation gene synthesis, which delivers highly accurate constructs at significantly lower prices and in far greater numbers than has been possible to date. George Church, Ph.D., professor of genetics at Harvard Medical School, director of the Center for Computational Genetics, and co-founder of Gen9. Dr. Church first became interested in synthetic chemistry and computational biology as a teenager and recently wrote a book entitled Regenesis: How Synthetic Biology Will Reinvent Nature and Ourselves. Drew Endy, Ph.D., assistant professor of bioengineering at Stanford University and co-founder of Gen9. Dr. Endy has been instrumental in launching several initiatives that are advancing the field of synthetic biology and advocating for its constructive use, including the BioBricks Foundation, the Registry of Standard Biological Parts, and iGEM, the International Genetically Engineered Machines competition. David Baker, Ph.D., professor of biochemistry at the University of Washington, Howard Hughes Medical Institute investigator, and scientific advisor to Gen9. Dr. Baker is known primarily for his contributions to protein design and prediction, including the Rosetta program that is used widely for protein structure prediction and design. Q: Why is DNA synthesis important? Endy: As a type of object in the world, DNA is one of the more important. It is responsible for coding most of the living world; it’s the molecule that’s right at the center of biology. 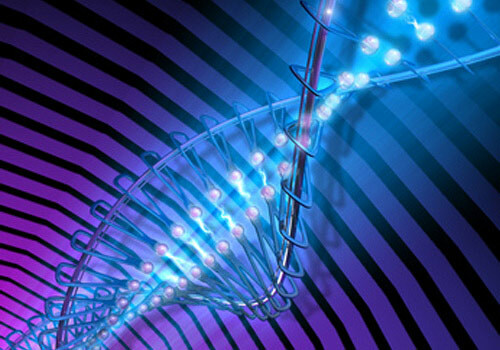 DNA synthesis allows you to construct DNA from scratch, so that’s an important technology. It’s shocking how little work has gone into getting better at building DNA. From a different perspective, we currently do not understand most of the biology on the planet. It’s one thing to take a system apart and try to understand its components—you learn by doing that. But another very powerful way of learning is to tinker: to perturb it, to poke and prod and change something and see what it does. With synthetic biology you can make DNA that encodes perturbations and put them back in natural systems to see how they behave. Q: What kinds of experiments are enabled by high-throughput gene synthesis? Church: There are two main applications: pathway engineering and genome engineering. There are probably many more people today doing biochemical pathway engineering, but the genome engineering is also very interesting. Pathway engineering tends to be about libraries while genome engineering tends to be about making a fairly specific goal. For pathways, what you want to do is gather together pieces of DNA from all over the biosphere that have the right components and make libraries. You fairly quickly get up to a large library size and the application is making large amounts of a chemical or a pharmaceutical or a fuel or something like that. You’re screening for the DNA molecule that confers the best type of enzyme and the best level of enzyme to achieve something. With genome engineering you generally have a more specific goal for your genome and typically the changes are more scattered about the genome. So far, these new genomes aren’t that different from the original genomes, due to uncertainty about proper functioning as you get too far from the original. Combinatorial complexity could be valuable here, too. Endy: We see a lot of people building DNA to help them discover and invent therapeutic molecules, enzymes so they can make chemicals, and molecules of DNA that can be used to help us understand how natural living systems work. Those are probably the three big uses right now: the scientific market, the drug market, and the manufacturing market. There are other people who are creating new markets. There are people who take DNA and don’t use it as a genetic molecule for encoding functions inside living systems; instead, they turn it into an instruction molecule. DNA can be programmed to fold up into two-dimensional or three-dimensional patterns outside of a cell, so you can use it to build stuff, e.g., an inorganic computer where the DNA scaffolds are templates where the inorganic metals go to make the computer. In another application, George just demonstrated the use of DNA for archival data storage of books. Baker: Protein design has huge promise, but is still in its infancy. What that means is that most of the designs we make will either not have the desired function at all or will have relatively low activities. We have to screen a lot before we get good ones. We’re making brand new things and we’re not very good at it yet. How well we can make things and how fast we can learn is totally a function of how many designs we can make and how many genes we can get. By being able to test 10 or 100 times more designed proteins with high-throughput gene synthesis, the activities of the best ones would perform much better and, second, we would get a lot of feedback on what works and what doesn’t. Protein design is not a major industry, but if we could make things on a much larger scale, then it really could be. High-throughput gene synthesis is an enabling technology for that. Q: What are some examples of proteins you’ve designed successfully or are currently working on based on this predict-and-test approach? Baker: We’ve already designed influenza inhibitors that neutralize the virus. Those are in development as influenza therapeutics by a major pharmaceutical company. We have designed enzymes which catalyze a variety of reactions, which aren’t catalyzed by naturally occurring enzymes. There’s a broad area of application for protein design. We’re now trying to design protein therapeutics against a broad range of infectious disease and cancer cell targets. We’re trying to make new materials—we just had a paper in Science on self-assembling proteins that will assemble into cages and other useful types of structures. We’re designing new vaccines, pathways for carbon fixation, and receptors for small molecules. These are all areas where high-throughput gene synthesis can make a difference. Q: What is compelling about Gen9 and its approach to synthetic DNA? Church: Gen9 is the only company that I know of actually delivering diverse sets of large DNA constructs assembled from oligonucleotides chemically synthesized on chips. Gen9 is also unique in their ability to do error improvement with or without sequencing—they’ve got all of those forces driving the error rate down and the price down. Baker: We do computer calculations and run Rosetta, which gives us many hundreds of different amino acid sequences that are predicted to fold up to have the property that we want. It’s easy to read off what the DNA sequences should be and to design genes for those, but making them has been the limiting factor. That’s what Gen9 lets us do really quickly. Gene synthesis companies have been around for a while, but you couldn’t go and order 400 genes. Q: What has Gen9 had to do to translate the synthetic biology advance from the lab to a commercial product? Endy: The essence of the technology had been demonstrated within academic laboratories—mainly by Joe Jacobson at MIT and George Church at Harvard. For Gen9, it was really a question of professionalizing the process around it, making it more reliable and able to be run in a repeatable way. From an abstract perspective, that’s all we needed to do: get so good at running these processes that we could reliably communicate with people about what we were going to promise them and then deliver against those promises. I don’t mean to understate the technical feat. Actually pulling this off in the real world is crazy challenging and it took several years to get this to all come together. It’s really a story of professionalization of a technology and unapologetic improvement and optimization of a manufacturing process. Q: What is Gen9’s responsibility in bolstering positive uses of synthetic biology without doing the same for detrimental uses? Endy: Our collective responsibility is to conduct our work in a way that is safe for the people at the company, for our customers, for the public, and the environment. We must help lead the field of synthetic biology such that, to the extent we can impact this, our technology is not intentionally misapplied to cause harm. And to engage with anybody, including other companies and governmental agencies, who wants to work constructively on such challenges together to identify what outstanding issues there are and how they can be mitigated.